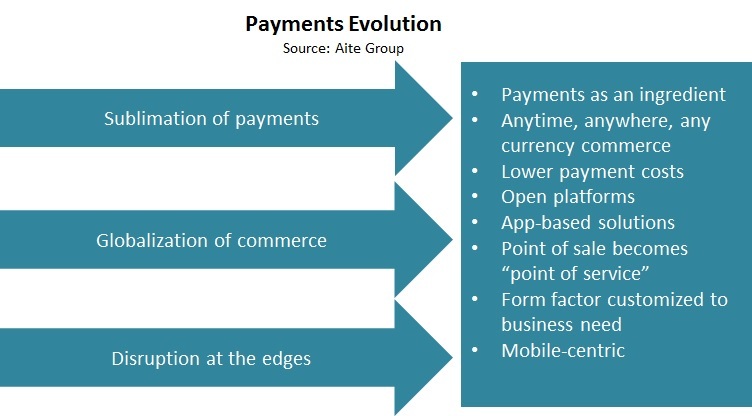 Change is inevitable, and every aspect of the payments ecosystem will be disrupted. Boston, January 28, 2016 – The global payments space is changing quickly and dramatically. It’s a struggle to keep up with the amount of systemic change, but three overarching trends are reshaping the payments ecosystem: sublimation, globalization, and disruption. By understanding these macro trends, it’s easier to understand what is relevant and important, and identify activities that might be less important as the space evolves. This report identifies three macro trends in the evolution of payments, describes companies that are helping to shape payments and exemplify one or more of these trends, and discusses the impact of these macro trends on the future state of payments. It is based on Aite Group interviews, presentations, and meetings with more than 50 payments organizations. This 22-page Impact Note contains 14 figures. Clients of Aite Group’s Retail Banking & Payments service can download this report.